I used to believe that we shouldn’t reward our children for tasks that they are supposed to do. That included school work. Then the LORD showed me that I am rewarded for behaviors that I am supposed to do, so why not the children? Sure, nearly all of the rewards from the LORD are not tangible items, but we will receive crowns in heaven. That’s pretty fabulous. I’ve also come to realize that it takes awhile for intrinsic rewards to happen and it isn’t wrong to provide other rewards while cultivating intrinsic ones. Hence… the different chore systems and reward systems we have used the last five years or so. And the reinforcers we use the first couple of weeks of school, as we transition to a full academic day. This year, we are using blue tickets. And my lovely blue drawers. Yes, I love blue, why do you ask? How does our reward system work this year? For every school assignment completed with a good attitude and with excellence, a ticket is given. 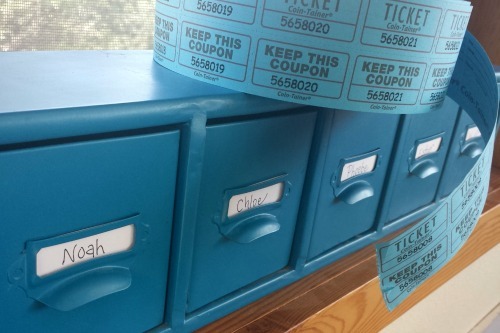 The tickets are stored in the lovely blue drawers. The child may exchange tickets for rewards. Our rewards vary, based on the interests of our children. 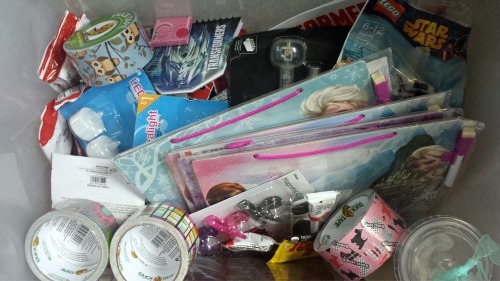 We have a big box with items in it that are “priced” such as fruit snacks, pencils and pens, little notebooks, fancy duct tape, and mini dry erase boards (thank you, Target dollar bins), and we also have a list of rewards that they can exchange for with their tickets. There are more and we will add rewards as the year goes on, based on the changing interests of the kiddos. You could easily provide rewards that are all cost free to you, but are valued by the children, if you wanted to or needed to do so. About a third of ours are free (ex: choosing a separate lunch, skipping your lunch meal chore, sleeping in, etc). Today is our first day and the motivation for the tickets is high. I know that the intensity of the motivation will ebb and flow, but I believe we have chosen motivating items for the rewards. As the day of school work ended, there were definitely disappointed children in that the higher priced items would require more than a day or two of school work, so a dose of reality and price value will be a part of the economy. 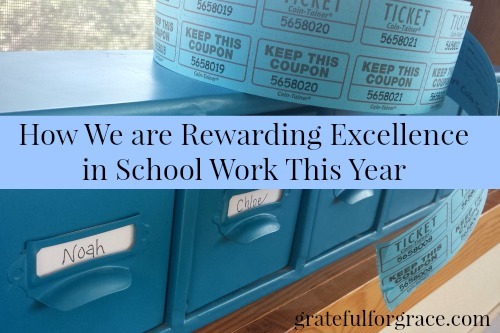 This reward system isn’t just to help the kids. It’s to help me also. If the children are motivated to stay on task, they will make me stay on task. It’s a win/win. We keep each other moving forward. Do I have rewards for myself? Not yet, but I’m thinking about making my very own reward list and giving myself tickets. Starbucks, lunch with a friend, a pair of shoes… fun! Not sure what the principal will think about that. Ahem. So, that’s what we are doing this year. Do you reward your children for completed school work? Do you reward yourself?